When the Temptations released Give Love at Christmas in 1980, they had already cemented their position as one of the greatest musical groups of all time. Now, I know that some Caucasian baby boomer who stumbled across this article is already guffawing at that statement, but I bet your 17-year-old nephew can summon the words to the chorus of “My Girl” 10 times faster than he can spit the lyrics to “Sgt. Pepper’s Lonely Hearts Club Band.” Until Paul and Ringo can shimmy-slide-kick while staying in perfect harmony, or Mick Jagger can produce a song where he sings actual notes, don’t come around here with that Rolling Stones and Beatles bull. 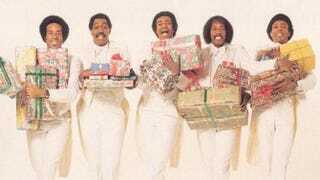 Anyway, 20 years into their career, the group went into a recording booth with a carton of Salem 100’s cigarettes in the soft pack, a fifth of Martell and a liter of S-Curl activator (it was 1980, after all) and proceeded to record what would stand forever as the theme song for the Black Holiday Season. The Temptations’ “Silent Night” isn’t even a carol—it is a love song to Christmas. It is a sermon, a slow jam and a gospel hymn. It brings tears to the eyes of Jehovah Witnesses, and Hoteps play it at Kwanzaa celebrations. Even though the song has become the signature tune for any Christmas gathering, it can be fully appreciated only after one has closely analyzed it like a great painting or dissected it like a great piece of poetry. It begins with a prelude of an orchestral rendition of “We Wish You a Merry Christmas,” which has nothing to do with the song they’re about to sing! The only explanation for this I could come up with is that it’s a trap to lure in Caucasian listeners. I imagine Hannah and Bradley Callahan gathering around the fire with their children, Kyle and Amanda, smiling at the first few notes before Eddie’s falsetto interrupts with that unmistakable real n—ga sanging. I’m sure it startled Hannah, but it was too late. By the time they reached for the eject button on the 8-track, Otis had already begun. Most people don’t know that until the mid-’90s, to get licensed as an R&B group, every fourth song had to feature a deep-voiced member whispering smooth-talking come-hithers to their female fans. It was called the “Race Music Bass Act of 1957.” I know this sounds like an inane fact I created out of thin air, but it is no more preposterous than following the introduction to a song about the birth of Jesus with the beginning of a poem about Santa Claus. It makes absolutely no sense except for a congressional decree or a little too much cognac. Either way, it still bangs. By now you have two parallel trains of thought going on simultaneously. OK, now we are down to the actual traditional version of “Silent Night.” Here is where the Temptations shine. It is as if the Mighty Clouds of Joy showed up at Jesus’ manger to sing him a lullaby. I’m sure that when Franz Gruber penned this classic in 1818, he had no idea that five doo-wop singers sporting Jheri-curled shags would put so much “stank” on it that Christ himself would play it at every one of his birthday parties. That took all of 45 seconds. Yep. There’s a second verse. Only your church deacon knows this verse. And Otis. But when he hits that second “Christ … the savior is born,” you get goose bumps in the backs of your knees and in the folds of your elbows. Don’t front. I know you did. That was worth wading through the preface, forward and introduction of the song to hear. Wait. Is he about to preach? In the song? That’s how you know Jesus is black—because there’s no operatic or hard rock version of this song that puts water in the corners of your eyes. The song is over, and now there’s a thick, syrupy feeling in your chest. That’s called “love.” A song did that. A song. The Temptations’ “Silent Night” actually brings joy to the world every time someone hears it. So play it often, because—like the song—in my mind, I want you to be free.